Cost: Tuition $470. Member Tuition $420. Materials Fee $100. When we set out to thoroughly learn a new skill it is often referred to as "Starting from Scratch". In this beginning blacksmithing class, we're going to be even more complete. To initialize a scratch you must have an itch and that is where we will start. Students will learn how to draw out tapers, upset, cut and split, punch and twist. The basic fuels and their use will be discussed as well as hardening and tempering along with forge welding of chain links. Simple projects and parts of projects will be the basis of this course, so remember, the basics of learning are about process, not about product. 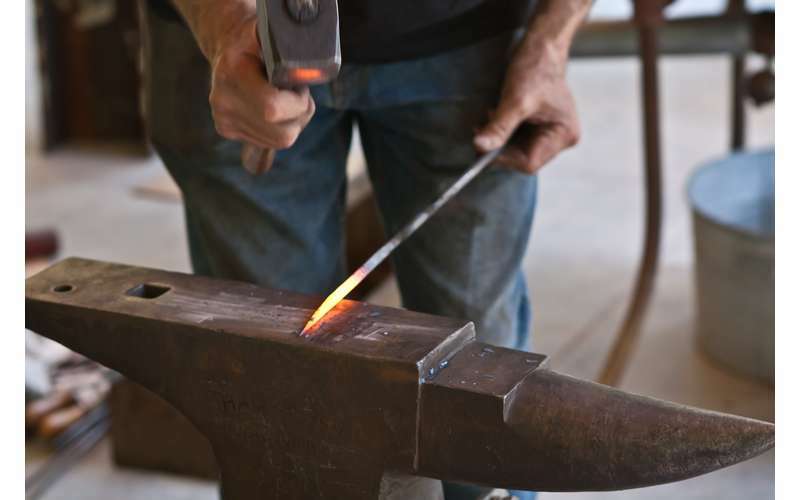 Come take your first class in blacksmithing where the itch you've had to try it will be satisfied and the fundamentals you will learn will more than scratch the surface. Bring a notebook and pencil. Be prepared to learn and have fun doing it! NOTE: Hard shoes and long pants are required for student’s safety. Owing to the physical demands and to safety issues, this class is suggested for students 18 years of age and older.